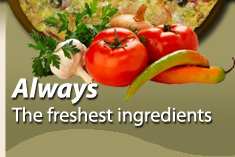 Our Pizzas are the freshest most delicious pizzas you have ever tried. The process starts early in the morning with the bases getting made by hand, fresh for each day. Shortly after, we recieve our delivery of fresh, quality ingredients. Our Pizzas are made fresh every order so you won't be disappointed. Beldon, Craigie, Duncraig, Hillarys, Kallaroo, Mullaloo, Padbury, Sorrento.